Magic is, unquestionably, one of the most enjoyable, beneficial, useful hobbies in existence, and anyone can learn to perform it well if he or she is willing to devote a little time and effort. 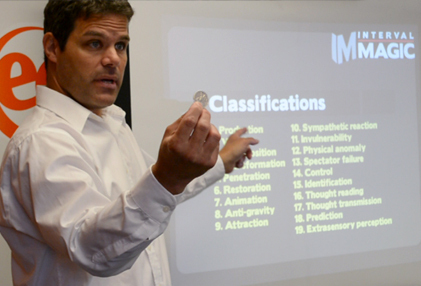 Whether your interest in magic is new, or you're a seasoned wonder worker, Tom Interval, who has conducted public and private lessons since 1985, will teach you not only amazing tricks, but how to perform them as part of a coherent routine that will baffle and entertain any audience, large or small. Because magic is adaptable to different themes and settings, it's an extremely effective sales tool. Tom Interval will travel to your office or annual meeting and teach your salespeople how to incorporate key sales points into a memorable, mind-boggling magic presentation, enabling them to leave existing and potential customers with a positive, lasting impression of your products or services. To learn more, please contact Interval Magic. An adult or child who wants to learn a few simple tricks to show your friends and family. A doctor who wants to use magic to help put your patients at ease. A parent or guardian looking for a great way to entertain your children, grandchildren, or nephews and nieces. A salesperson who wants to break the ice with a new client. A teacher who wants to incorporate magic into your lessons. A clown who wants to add a few colorful tricks to your show. A beginning or intermediate magician who wants to take your act to the next level. An actor, producer, director, author, or student who needs consultation for your project (see Consultation below). No matter what your reason or skill level, Tom Interval will show you how to perform magic step by step with a tried-and-true method he's been using for decades. Lessons are available in one-, two-, and three-hour sessions for ages six and up and are discounted if you commit to multiple lessons. To learn more, please contact Interval Magic. Tom Interval sometimes offers classes at libraries, schools, and other community locations. These classes will be listed here when scheduled. Please check back from time to time. Whether you need close-up shots of someone performing sleight of hand in your film or television show, technical assistance for a magic scene in your theater production, or advice regarding a magic character or illusion in your book, Tom Interval can help. Please contact him for more information and availability. To read about Kristen Connolly (The Cabin in the Woods, House of Cards) consulting me about her new role as Bess Houdini in History's two-part miniseries, Houdini, starring Adrien Brody, check out my blog. Magic and the Mind is a week-long, 20-hour, youth-enrichment program that teaches middle- and high-school students about psychology, neuroscience, and critical thinking as revealed through some of the techniques magicians use to fool people's minds. Designed by cognitive scientist Dr. Iris Oved and Tom Interval, the program will be offered in the summer and fall of 2014 through the University of California (UCSD) Extension. Please visit the Magic and the Mind website for details. Reading Magic is a nonprofit, curriculum-based program designed to inspire children ages six and up to read about a multitude of academic subjects while developing useful life skills learned through the study of magic as a hobby. The program, presented at schools and libraries, covers simple magic tricks and theory employing math, science, psychology, perception, history, and theater. To learn more, please see the Reading Magic section of this site.